Patrick Xavier was born at 11:10 pm! He was our littlest baby so far, weighing in at 8 lbs 12 oz and measuring 22 inches. His head was 14 1/4 inches around. 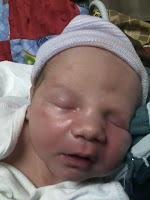 His face and head are a little smooshed at the moment from the 34 hours of labor before the c-section! So far he's a super laid back baby. He let out a few little cries when he was born, and a few more when he heard my voice. He didn't make a sound when hey gave him a shot. He's nursed for one hour of his two hour life and is now dozing peacefully. And... somehow... he was transverse (although when labor started he was head down, which was confirmed in triage with an ultrasound). We're so excited to be blessed with this little guy. I'm feeling surprisingly good. I'll write more later, but I just had to give you an update tonight and thank everyone for the prayers! They helped carry me through this day! Yay!!! I'm so glad that things worked out even if they didn't go the way you wished. Having him come out side ways wouldn't have worked. My husband was a c-section baby for similar reasons. He was completely upside down and sunny side up. So don't sweat it. You did great Momma! Now go rest! Patrick is so beautiful, Cammie, what a gift! I'm so glad to hear that you and Patrick are doing well. I bet the girls can't wait to meet him! Thank you, Father! Now enjoy your new little one. What great news to start my day with!! Congrats to all of you!! We look forward to seeing more pics of Patrick w/his mom, dad and sisters! I love his name - and he is one CUTE baby!!! Deo gratias! Congratulations, he's adorable! YAY! I was very much hoping to wake up to this goods news. You have already given so much for this little one - what a blessed child he is! Congratulations momma (and daddy)! Congrats!! Welcome little Patrick Xavier!! I'm glad everything went well. Blessings to you all!! I've been reading your blog for a while, but have never commented before. Today, though, I am so happy for you that I cannot contain myself any longer - CONGRATULATIONS! I'm so happy for you and your family. This is the best news to wake up to. I hope your recovery goes well. Yay! Congrats!! 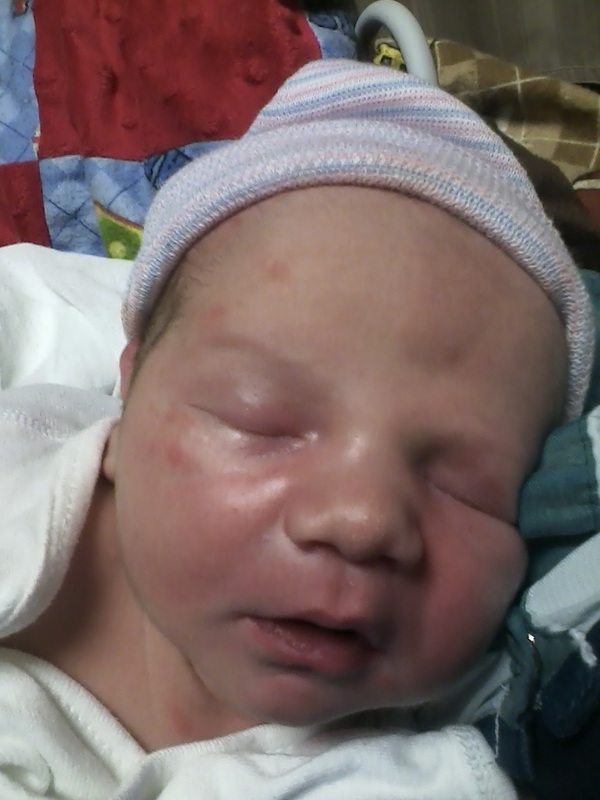 Welcome to the world, sweet Patrick! Hurray! Congratulations. I'm so happy for your family. Welcome, beautiful little Patrick!!! Great job, Cam! I already serial posted on your facebook LOL but I just wanted to say congrats again here. Are you going to type up a birth story at some point? I am glad Patrick arrived safely and I am sorry you did get the birth you wanted to have. I know the disappointment you are feeling mixed in with the excitement of having him here. Many congratulations and blessings to you all! He is so sweet! Congratulations! What an awesome blessing for all of you! Great name! Far, far, far and away the best news I've heard this week. Congratulations. Congratulations, Cam and Paul. He is very cute! CONGRATULATIONS! Marvelous that he came out with a good appetite. One of my midwives joked the smaller size was why K turned during labor (granted not quite the same way) since I was "madefor bigger babies". It happens though... Glad evwrything went well and that hes here. He's a cutiw! Typed out a reaponce a out the tir.ing but lost it all... Long story short mu midwife put ours to me being built for bigger babies and was the first thought that came to mind readinf yours. It happens though and glad all is well.he's a cutie! Kat and I give you our most heartfelt congratulations!